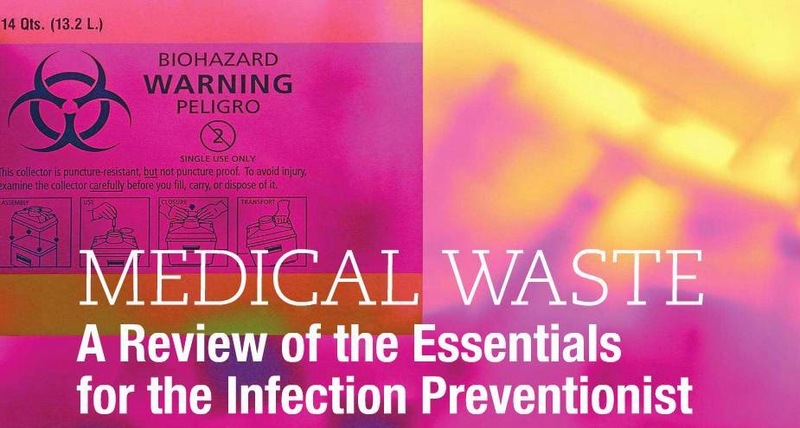 Phenelle Segal, RN, CIC, infection prevention and control consultant, provided insight for an article published in the August 2014 issue of Infection Control Today titled "Medical Waste: A Review of the Essentials for the Infection Preventionist." In the piece, Phenelle highlights that responsibility at the infection preventionist level begins with CMS requirements as well as accrediting agency standards such as those from The Joint Commission. CMS §482.42 Condition for Participation states that "The hospital must provide a sanitary environment to avoid sources and transmission of infections and communicable diseases. There must be an active program for the prevention, control, and investigation of infections and communicable diseases." The Occupational Safety and Health Administration (OSHA) standard relating to bloodborne pathogens, known as 29 CFR 1910.1030, and California OSHA's Safety Order 5193 must be adhered to by all healthcare facilities, and an exposure control plan must be written in accordance with regulations. Disposal of biohazardous waste should be addressed as part of the exposure control plan. Several states fall under the surveillance of federal OSHA while some states have their own regulations. Medical waste and "red bag trash" is clearly defined by OSHA, and is to be discarded in a manner consistent with the regulations set forth by the agency. Disposal of sharp objects such as needles and lancets are classified as medical waste and fall under the policies set forth by facilities for management and disposal of such waste. Unfortunately, medical waste disposal can be confusing in terms of what is considered "red bag trash" and what is considered regular trash. Phenelle, during her on-site visits to various types of healthcare facilities, including ambulatory surgery centers, dental/oral surgery practices and hospitals, sees ongoing use of "red bags" and biohazardous containers for trash that is not considered "other potential infectious material." Overuse of biohazardous waste can be costly to the facility and burdensome to the waste haul carriers. Education of staff at time of hire and at least annually is a requirement, and begins with the infection prevention department. Infection preventionists should keep records of the education provided. Medical waste must be identified and labeled as such as OSHA will fine a facility for failing to distinguish between trash that is regularly disposed of and potentially contaminated waste. Phenelle provides OSHA compliant policies for all sectors of healthcare. To learn more about the services provided by Phenelle, visit the website of Infection Control Consulting Services.